Empanadas are a holiday tradition for some. Of course, they also make a wonderful addition to any brunch! Combine the flour salt and sugar in a mixing bowl. Cut in the lard/ shortening and butter until the mixture resembles small peas. Add enough water to form a soft dough. Chill the dough wrapped in plastic or in a plastic bag, for approximately 30 minutes, while you combine the ingredients for the filling. Roll the dough on a lightly floured surface to 1/8” thickness. Cut 5-inch circles. Place approximately 2 heaping tablespoons of filling on one half of the circle. Moisten the edge with water. Fold the dough over and press the edge together with a fork. Cut a small slit in top of the empanadas. You can brush the empanadas with some more water and sprinkle them with some cinnamon and sugar before baking. Bake the pies at 350 degrees for 12-15 minutes, or lightly browned. 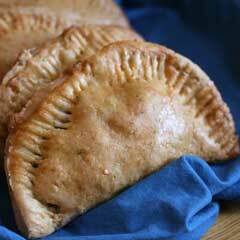 Fried empanadas: Do not cut a slit in the dough; do not dust with cinnamon sugar before frying. Fry in hot oil (325-350°) until golden. Dust or dredge in cinnamon sugar mixture.